Biotique Skin Care - Worldwide Shipping. Nourishes Skin. Helps to Reduce the look of Scars and Stretch Marks. This emollient balm blends pure cocoa butter, mustard oil, the bark of the arjun tree and Indian butter, to give the body a firmer, more toned appearance. 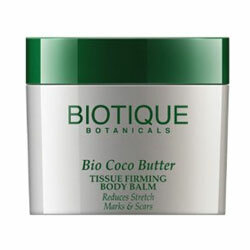 Nourishes skin and helps reduce the look of scars and stretch marks with regular use. Massage into body skin, from feet to neck, using circular motions until absorbed. Concentrate on scars, stretch marks and sagging skin areas. Apply daily for best results.